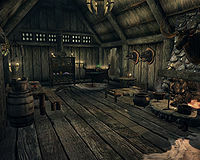 Falion's House is the home of the town wizard in Morthal. The house is the residence and shop for the wizard Falion and his child apprentice Agni. 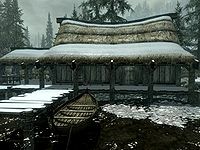 The house is located on the edge of the water behind the Thaumaturgist's Hut, along the jetty from Alva's house in Morthal. There is a covered porch along the front of the building and continuing around to the left. There are two wooden benches and a food barrel to the left of the front door. In the area to the left are two more wooden benches, a large pile of firewood and a grindstone. This is a one room home, from where Falion also sells his services and items. On your left upon entering is a long wooden table with a food barrel beside it. On the table is a sample of snowberries, several loaves of bread, a bottle of wine, two bottles of Nord mead, a salmon steak and four pine thrush eggs. Above the table, hanging from the ceiling are two garlic braids, two bunches of elves ear, and two bunches of frost mirriam. To the right of the table is a basket containing two leeks, with a hanging rack above holding three rabbits. In the northwestern corner is a chair and against the north wall is a set of shelves holding copies of The Great War, Azura and the Box and the Enchanting skill book Catalogue of Armor Enchantments, as well as a Draught of Extra Magicka, a Potion of Extra Magicka, an Enchanter's Potion, an Enchanter's Draught, six bottles of alto wine, a bottle of wine, two filled petty soul gems, two filled common soul gems and one empty common soul gem. The potions become available for purchase from Falion once you have the Merchant skill perk. There is an arcane enchanter in the northeastern corner. Against the east wall is a single owned bed coming out from the wall, with a round wooden table holding two bottles of Black-Briar mead and a copy of the Restoration skill book 2920, Rain's Hand, v4 to the left of the bed. In the middle of the east wall is a fireplace with a steel sword on the mantelpiece and a cooking pot on a stand in front. To the right is a tall wardrobe containing clothes. Against the south wall is a square wooden table and two chairs. On the table are five loose coins and a medium coin purse. In the southwestern corner, along the west wall is a second single owned bed with an unlocked chest at the foot of it. With Dawnguard installed, if you ask Serana about curing vampirism, she will go here and in a few days she will come back cured from being a vampire.